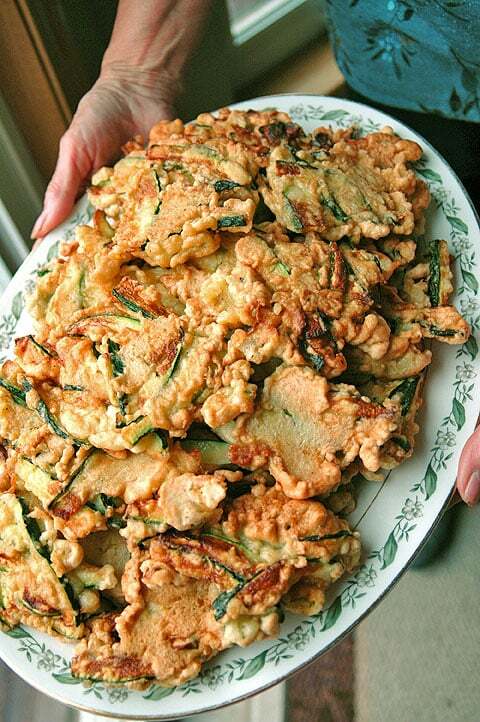 Nonna’s Batter-Fried Zucchini – These zucchini fritters are swoon-worthy! 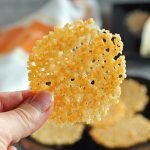 Make them for an appetizer or side dish! A huge family favorite from Naples. Although I rarely eat fried foods, I can’t imagine my life without these savory fritters, so I was determined to stick it out until…victory was mine! So, let’s pretend it’s August, when zucchini were exploding in everyone’s gardens (maybe you still have some left?) and I was all set to post this recipe. 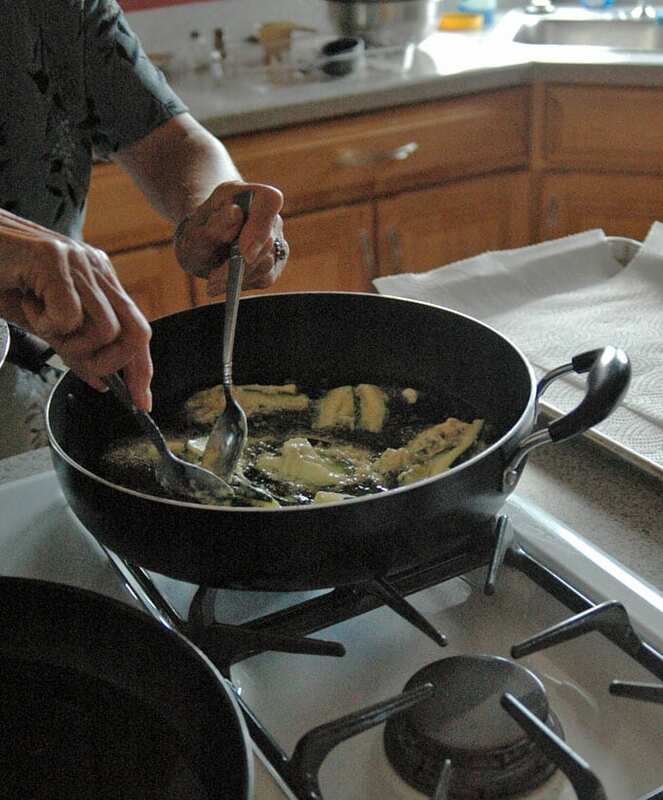 Here’s a behind-the-scenes account of how family recipe documentation occurs at Cooking with Mamma C.
So we hang up, and I attempt to make the zucchini with my sketchy notes. Except it wasn’t enough. The batter, I mean. My fritters were falling apart. They tasted okay, but something was definitely off. So, I called Mom again. So Mom and Dad came over for a cooking session. Of course, Mom brought all of the zucchini, eggs, oil, her own pans, and paper towels, just in case I didn’t have any. And I made the zucchini with her, trying to take notes as we went. But Mom still “forgets” that I have to measure everything, and I caught her adding salt and pepper to the eggs without letting me pin down the amounts first. According to Mom, she puts in a dash of each. But I counted four dashes of salt and three dashes of pepper, for what it’s worth. 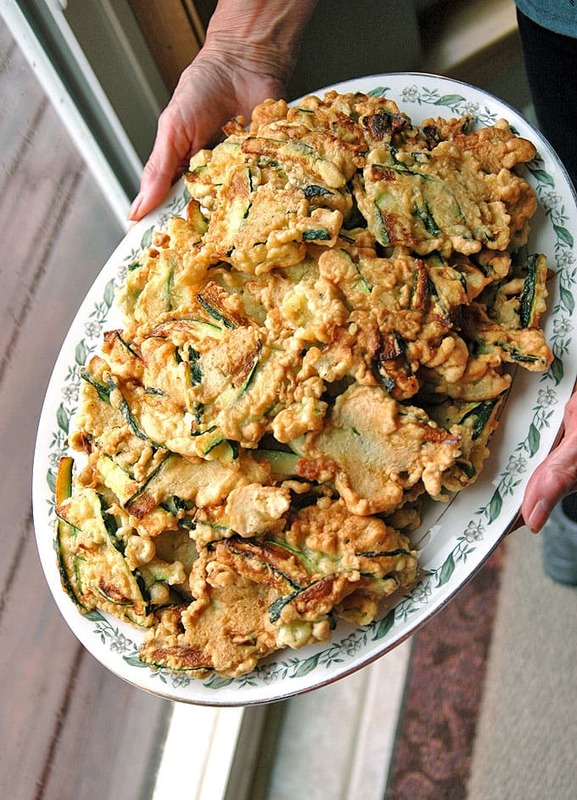 But then…then…oh my goodness, there they were, Nonna’s batter-fried zucchini that I adore, made just like in Naples, coming out of my kitchen for the first time! Dad and I couldn’t wait for them to cool, so we were shoving them into our mouths while they were still hot and crispy. I added more salt to mine at that point, because when they’re that hot, you can’t fully taste all of the flavors yet. I love them crispy, but when they cool off and soften, you can really taste the depth of flavor from the eggs, the oil, the zucchini, and the salt. To die for. You can make these for an appetizer or side dish. The leftovers are great for breakfast or packed lunches, or just an anytime snack. Just make these at some point in your life. I want you to know what you’ve been missing. P.S. I did try to make these in the oven, but they just were not the same. Go big, or go home with this one. Rinse zucchini and pat dry. Trim off ends. 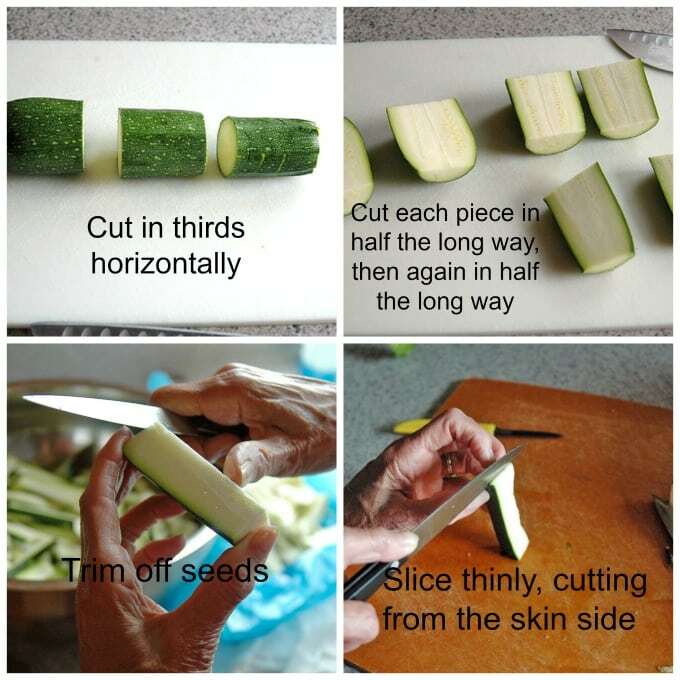 Cut zucchini horizontally into thirds (if your zucchini is small, you can just cut it in half horizontally.) Next, cut each piece of zucchini in half the long way. Then cut each of those pieces in half the long way. Using a small knife, trim off the layer of seeds (if there are any) from each plank of zucchini. (The seeds affect the flavor.) Next, thinly slice each plank, starting along the side with skin. You should end up with strips of zucchini about 3 inches long, 1/8 inch-to-1/4 inch thick, and around 3/4 inch wide. Each strip should have an edge of green skin on it. 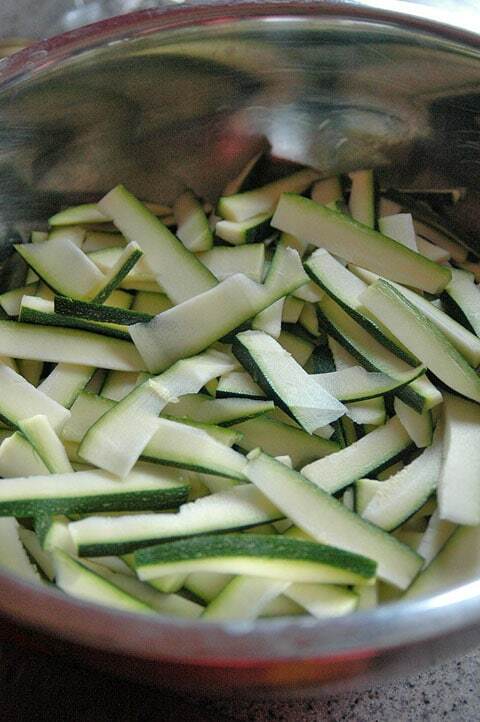 Place the zucchini strips in a large mixing bowl as you slice them. Let the strips sit in the bowl to dry out for at least 30 minutes. In a medium bowl, mix flour with 1 1/3 teaspoons salt and 1/3 teaspoon pepper. In a small bowl, crack your eggs and add the dashes of salt and pepper to them. 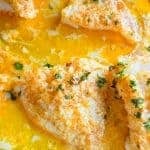 Beat the eggs with a fork or whisk. When the zucchini has had time to dry, add the seasoned flour to the zucchini bowl. Mix it with your hands, making sure to reach the bottom of the bowl. Then pour the beaten eggs over the the floured zucchini, and mix everything with your hands. Wash your hands well and set up your frying station. Besides your frying pan and oil, you will need two large spoons, a spatula, if desired, and baking sheets lined with paper towels. Heat the oil in a large frying pan on medium high. Test to see if the oil is hot enough by dropping a pinch of batter into the oil. If it sizzles and bubbles, the oil is ready. Use a large spoon to scoop some zucchini and batter (maybe five strips of zucchini at a time, but they don't all have to be the same). Use the other spoon to gently scrape the zucchini and batter into the oil. 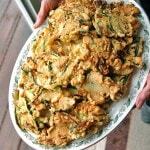 Continue adding spoons of zucchini and batter to the pan in a single layer, not letting the fritters touch each other. Cook the zucchini on the first side until you start to see the batter turning golden around the edges. This should take around 4 minutes. Use a spatula or (spoons) to check the other side and see if it is golden. If so, it is ready to flip. Cook the fritter on the other side for 1-2 minutes, until the batter is golden on the bottom. As each fritter is done, remove it from the pan and place it on the paper towels so that the oil will be absorbed. Continue frying all of your zucchini, adding extra oil if the level gets low in your pan. (When making large quantities, discard oil when it darkens and replace it with fresh oil.) Blot the tops of your cooked zucchini with paper towels to absorb excess oil. Wait a couple of minutes before tasting the zucchini and be careful, because they will be hot. Add extra salt to your portion if needed. Wait to add any extra salt to the rest until they cool completely. At that point, you should be able to taste the full depth of flavors, and you may not need any more salt. Serve as an appetizer (usually three per person) or as a side dish (maybe five per person). Store leftovers covered with foil (not plastic or they will become too moist) in the refrigerator for up to three days. Do not reheat leftovers. Rather, eat them cold or let them come to room temperature. We made a big batch of zucchini for the photos, starting with 3 1/2 pounds of zucchini. The recipe logic works like this: Pay attention to the pounds of zucchini left after you trim off the ends and seeds. We ended up with about 3 pounds of zucchini strips. For each pound of zucchini strips, use one cup of flour. For each cup of flour, use two jumbo eggs. Awesome recipe. On my list of to do. My book of family recipe’s says “secrets Nonna told me not to tell.” Of course I ignore this but yours definitely looks great. Hi Ted – I hope you love this zucchini as much as we do! It’s great that you have a book of family recipes! Hi Duncan – I love hearing that you grew up eating these in Naples! They’re definitely worth growing zucchini. I love hearing that, Christine! I’m so glad you enjoyed these. Grazie! I loved this post. I reminded me of trying to get so many recipes from my mom. I loved that your parents brought everything over to your house in case you didn’t have them! Priceless. Please give your parents a hug from me because they reminded me of my parents. 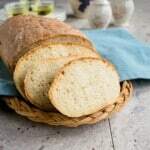 I hope to try this recipe very soon and thank you for writing it down. Oh, these look amazing! 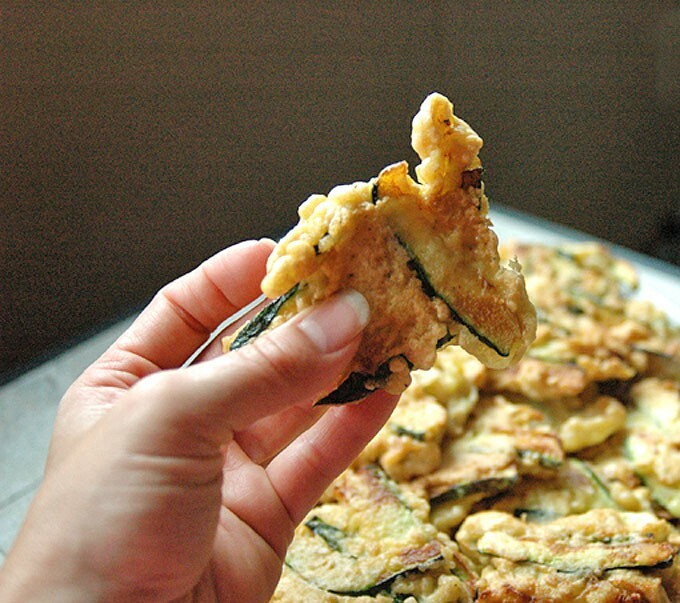 Love zucchini fritters, but these look 1000 times better than the ones I’ve had! Thanks, Denise! I think making sure each strip of zucchini has an edge of green skin makes the fritters look beautiful. Haha, Tekesha. I wish we lived near each other, because you know I would do just that. 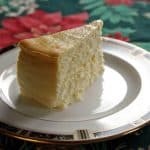 The primary reason I started this blog is to nail down the family recipes, and it’s so gratifying to accomplish that, one by one, and share it with others. Um….give it a try! I bet you and your family might enjoy! Keep in touch now Andrea. Your Fl. 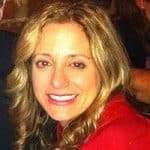 bud, Cheryl. These look so good!! Crispy and just perfect! You took a garden goody and made it extra extra extra good! Swooning at how great this must taste! Nonna was a genius in the kitchen. These are definitely swoon-worthy!